Rossie O. Knight was a son of Sovin J. Knight and Ann Eliza Allen of Ray City, GA. 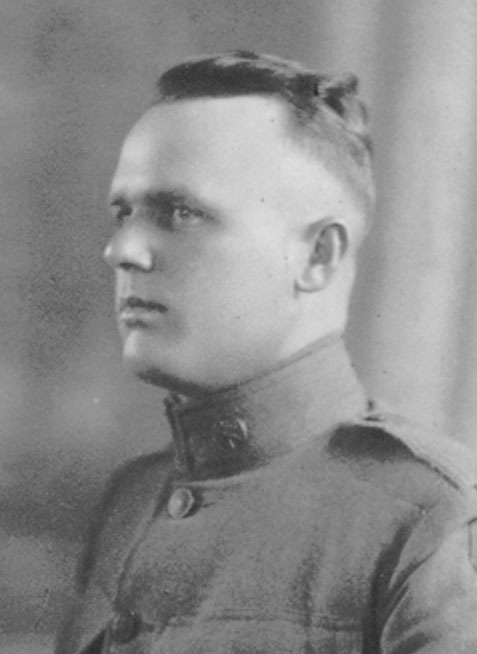 In the years from 1913 to 1917, Rossie was engaged in America’s preparation for the coming conflict, in military service with the Coast Artillery Corps at Fort Hancock, NJ, and working to produce war matériel at the Nixon Nitration Works. On April 6, 1917, the United States Congress formally declared war on Germany and its allies. By August 7, 1917 he was serving overseas with the U.S. First Division . He received the Victory Medal with five battle clasps for his service with the 1st Division Ammunition Train in France during WWI. After the Armistice was declared on November 11, 1918 Knight served in Germany as part of the Army of Occupation. On August 6, 1919 he was transferred from the 1st Division Ammunition Train to Company B, 7th Machine Gun Battalion, and on September 17, 1919 he finally got his sergeant’s stripes back. 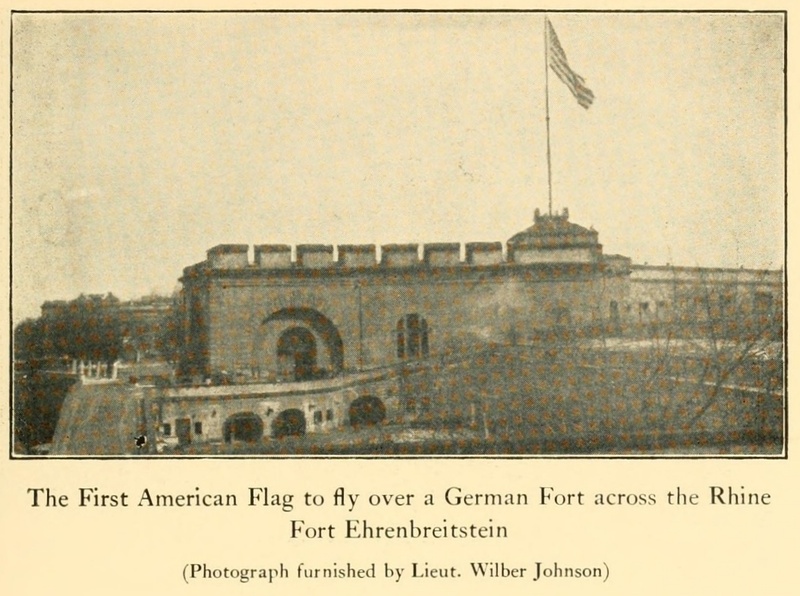 For the next 18 months, Sergeant Knight was stationed with his company at Ehrenbreitstein Fortress, Koblenz, Germany. Ehrenbreitstein Fortress (German: Festung Ehrenbreitstein) is a fortress on the mountain of the same name on the east bank of the Rhine opposite the town of Koblenz in the German state of Rhineland-Palatinate. Ehrenbreitstein was built as part of a strong ring of fortifications around Koblenz, the largest military fortress in Europe after Gibraltar. 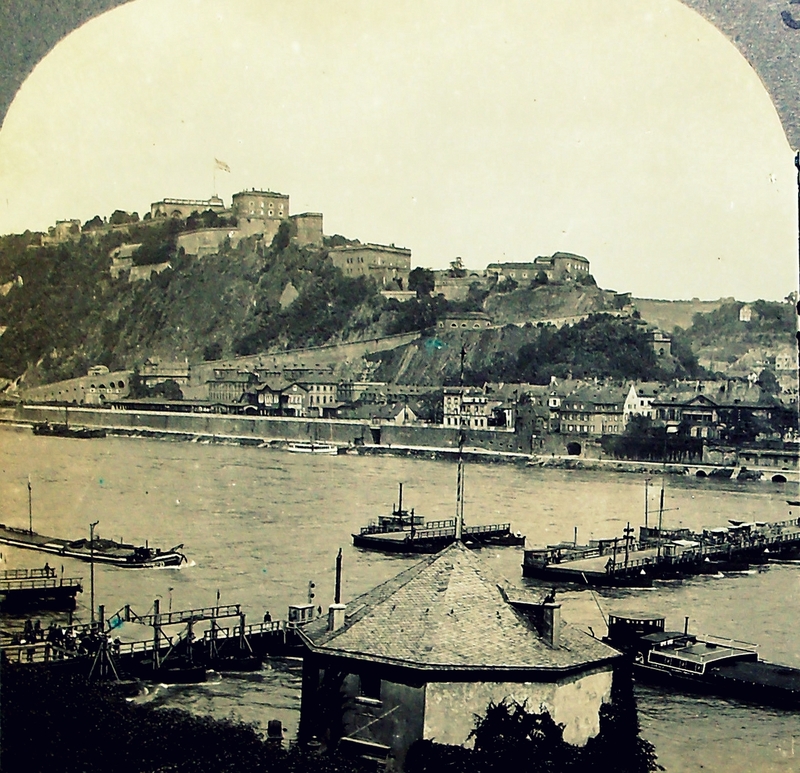 When the Koblenz fortifications west of the Rhine were dismantled in 1890-1903, Ehrenbreitstein Fortress remained as the main defense of the Rhine crossing. After WWI it was occupied by the US Army as their headquarters during the Occupation of the Rhineland. 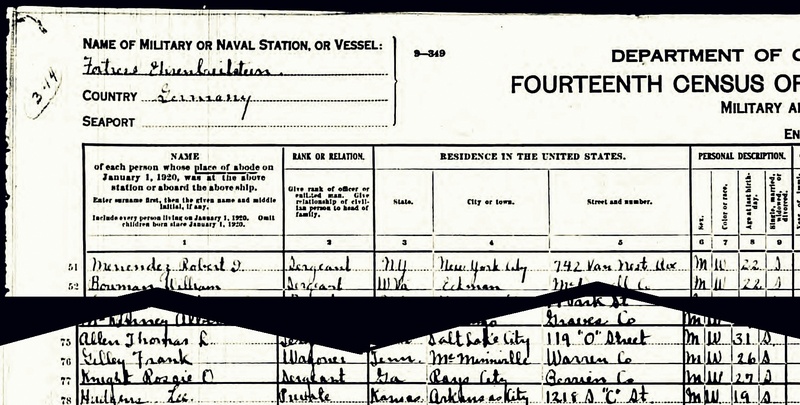 In the 1920 census, Rossie O. Knight was enumerated at Fortress Ehrenbreitstein, Koblenz, Germany with Company B, 7th Machine Gun Battalion. On February 14, 1921, the 7th Machine Gun Battalion ceased to exist pursuant to War Department orders. Rossie O. Knight was a son of Sovin J. Knight and Ann Eliza Allen, and grew up on his parents’ farm near Rays Mill (now Ray City), GA. He moved with his parents to the area of Barney, GA in 1911. His father, Sovin J. Knight, died April 16, 1911 shortly after the move. Rossie joined the Army in 1913. He was stationed at Fort Hancock, NJ until August 1917 when he shipped out to France with the 1st Division. 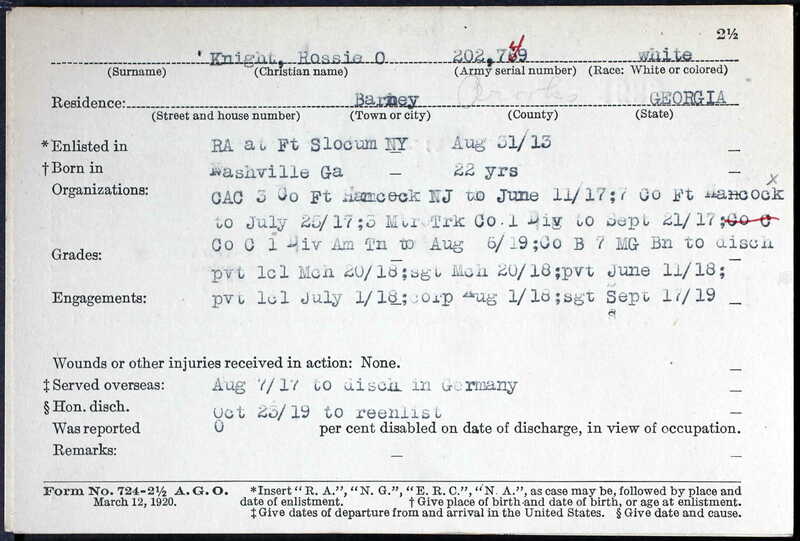 Rossie O. Knight’s service records show he participated in four major 1918 offensives of World War I: Montdidier-Noyon, Ainse-Marne, Saint Mihiel, and Meuse-Argonne. He also served in the Toul Defensive Sector. In recognition of this service he received the WWI Victory Medal with five clasps. The Victory Medals were awarded after the end of World War I. Veterans completed an “Application for Victory Medal” and the medals were mailed to the servicemen instead of awarded in person. For example, the boxes containing the Victory Medals for United States Army World War I veterans were mailed out by the depot officer at the General Supply Depot, U.S. Army, in Philadelphia, Pennsylvania, in April 1921. An outer light brown box with an address label glued to it and its postage area marked “OFFICIAL BUSINESS, Penalty for private use $300” contained an inner white box stamped with the bars the serviceman was supposed to receive on his medal. The inner white box contained the medal, which was wrapped in tissue paper. The 1st Infantry Division was literally America’s first division. When the United States entered World War I in April 1917, it had no divisions. President Woodrow Wilson promised the Allies he would send “a division” to France immediately. Four infantry regiments (16th, 18th, 26th and 28th) and three artillery regiments (5th, 6th and 7th) were ordered from the Mexican border in Texas to Hoboken, NJ, to board transports for France. On June 8, 1917, Brigadier General William Sibert assumed command of them as the “First Expeditionary Division.” Organized as a “square” division of more than 28,000 men, the First Division was twice the size of either the Allied or German divisions on the Western Front. The First Division won the first American victory in World War I at the Battle of Cantigny. Cantigny is a small village north of Paris, in the Picardy region of France. Held by the German Army, Cantigny formed a dangerous salient in the Allied lines. On May 28, 1918, the First Division attacked and defeated the German forces in the village and held it against repeated German counterattacks, despite suffering more than 1,000 casualties. The success raised the Allies’ morale, convinced the British and French that the Americans were capable of operating in independent fighting units, and disproved German propaganda about American incapacity. 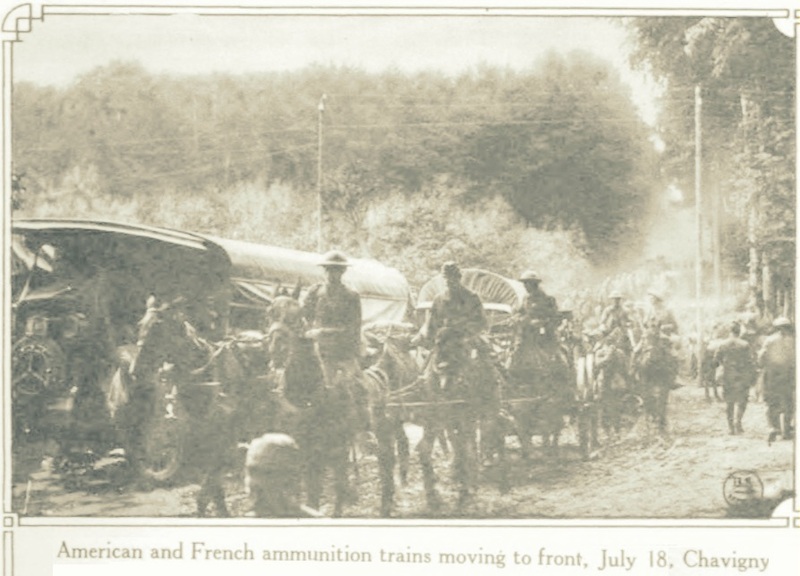 From August 22 to October 18, 1917 the 1st Division Ammunition Train and Rossie O. Knight were attached to the Scottish 15th Division at Le Valdahon, France. 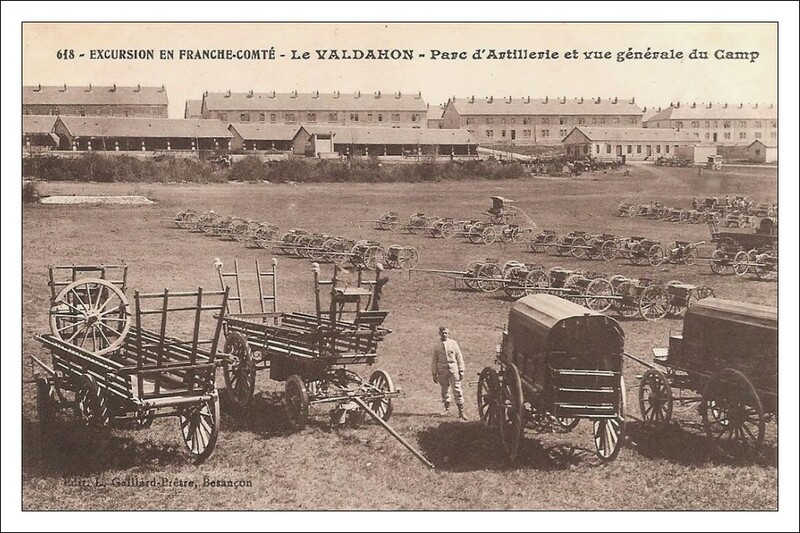 According to the U.S. Army Handbook of Ordnance Data, Valdahon was a Field Artillery training camp, where troops were issued 75-mm guns and 155-mm howitzers, and received technical instruction in their operation. Sergeant Rossie O. Knight and the U.S. 1st Division were assigned to the Montdidier-Noyon sector when the Germans made an offensive there on June 9-13, 1918. 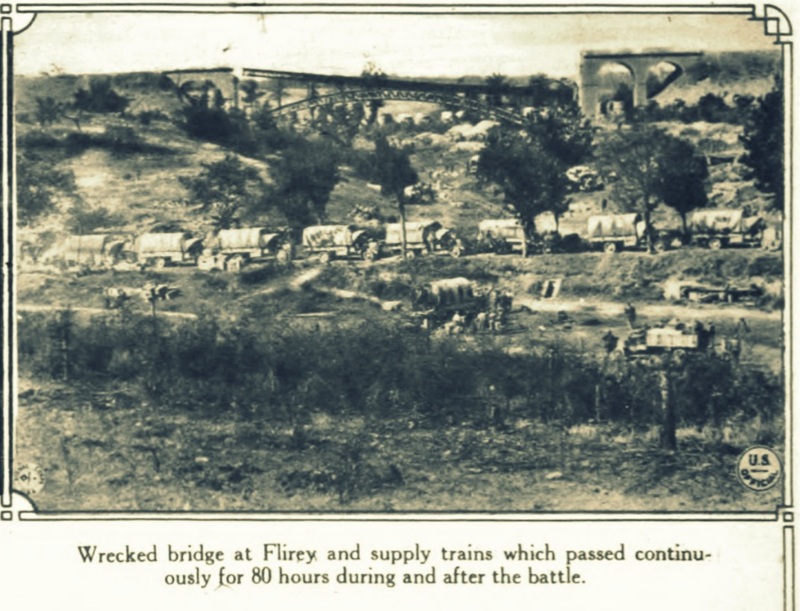 Service in this sector proved to be typical active trench warfare, and the companies of the Ammunition Train were occupied ferrying small arms munitions and artillery rounds to the front lines. The German infantry launched an attack on the night of June 8-9, 1918. Twenty-one German divisions attacked the French on a twenty-three mile front extending from Montdidier, France to the Oise River at Noyon. The main assault was against the left of the French division which was on the right of the U.S. 1st Division; In this action the U.S. 1st Division took artillery fire and repelled diversionary raids. The battle was opened by an intense German artillery bombardment, which began at midnight…there was an extensive use of gas, both chlorine and mustard. 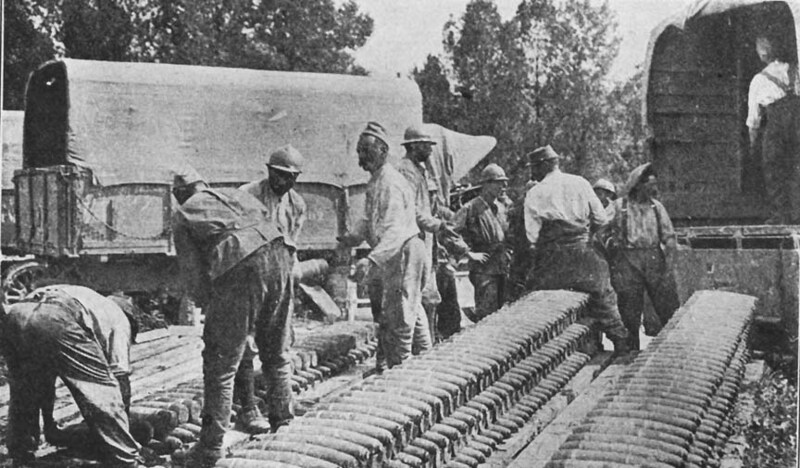 The Germans attempted to neutralize the Allied artillery batteries by firing on them with phosgene and mustard gas. Along the roads shrapnel was used and the front positions were shelled with gas and high explosives. The assault continued during the next five days. Though the U.S. 1st Division was not directly engaged, it was subjected to intense artillery fire and its units participated both defensively and offensively in several raids. The Germans advanced from 2 to 5 km. (1.2 to 3.1 miles) and came close to breaking the Allied lines. But the French had anticipated the assault, and the counterattack was successful in holding the Germans. This was the first repulse of a German offensive in 1918, and is regarded by some authorities as the true turning point of the war. 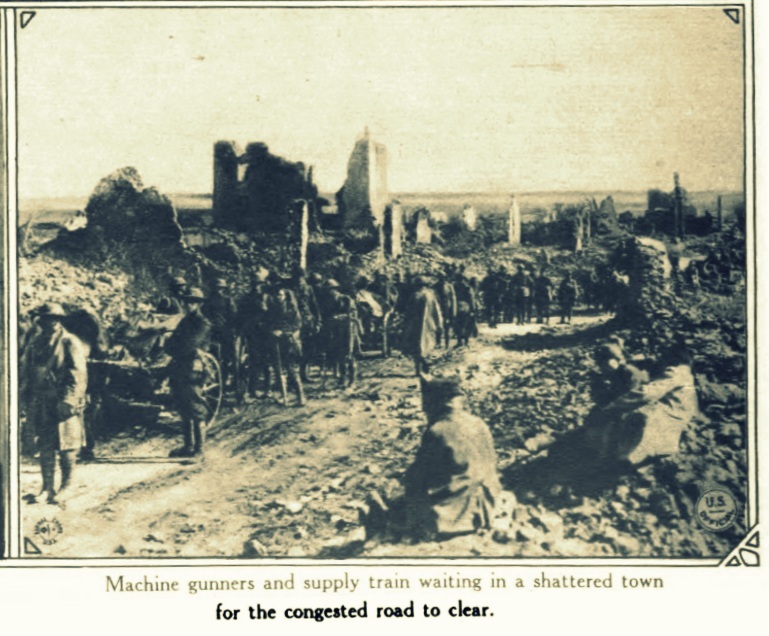 Activities then diminished rapidly, relatively speaking, but from the time that the 1st Division captured Cantigny until it turned that sector over to the French, there was continuous heavy shell fire, with gas attacks and many raids, though all of the last mentioned were repulsed successfully. The fighting was over by June 12, 1918. The fighting capacity of the German army was critically damaged with little to show for the heavy losses incurred. For Rossie O. Knight personally, the Montdidier-Noyon Offensive was up and down. He started out the battle as a Sergeant, but on June 11, 1918 he was busted down to the rank of Private for some unknown infraction. By the end of June, Rossie O. Knight had at least regained his status as PFC. He continued to serve with the 1st Division Ammunition Train, keeping the front lines supplied with ammunition through the Allied counter-offensive known as the Aisne-Marne Campaign. The Ainse-Marne action also known as the Second Battle of the Marne, began on July 15, 1918 when 23 German divisions attacked the French Fourth Army east of the city of Reims, France. Just days earlier on July 10th, fellow Berrien countian Lawrence Ryan Judge, a sergeant with the 1st Division’s 26th infantry, was killed in action. In the Ainse-Marne Offensive, British, French and American troops, including the U.S. 1st Division, held the Germans back for three days at the Marne River. Even before the German offensive on the Marne, the Allies had been planning a massive counterattack in the area. 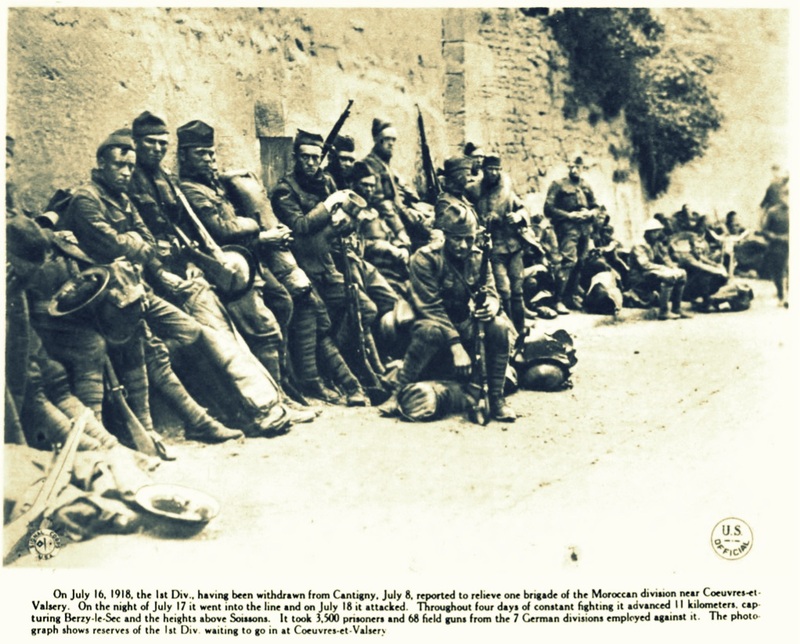 July 1918, men of the US 1st Division waiting to enter the Ainse-Marne Offensive. After three days of fighting at the Marne, it became evident the German offensive was weakening. The German attack failed when an Allied counterattack led by French forces and including several hundred tanks overwhelmed the Germans on their right flank, inflicting severe casualties. The Allied counterattack was launched on July 18, with fourteen divisions including the U.S. 1st Division. According to J. Rickard, “All around the line the Allies advanced between two and five miles. That night the Germans were forced to retreat back across the Marne river. The rapid Allied advance threatened German communications within the salient and even offered the chance of trapping the German troops around Château Thierry.” One Berrien county solider who fought at Château Thierry was Private John Lory McCranie, of Adel, GA. McCranie was fighting with the 42nd Division and also later saw service at Saint Mihiel, Argonne Forest and Sedan. He died shortly after the war as a result of having been gassed. July 25, 1918. Trains moving up to the Marne salient. Faced with this massive Allied counterattack the Germans dropped back to form a new defensive line along the line of the Aisne and Velse rivers. As the Germans fell back and the 1st Division moved up, Rossie O. Knight also advanced, moving to the rank of Corporal on August 1, 1918. The new German line began to form up around August 3. On August 6, the Americans probed the new line and were repulsed, ending the offensive, but the German defeat marked the start of the relentless Allied advance. Since the fall of 1914, the Germans had occupied the Saint-Mihiel salient, a triangular wedge of land between Verdun and Nancy, in northeastern France. By heavily fortifying the area, the Germans had effectively blocked all rail transport between Paris and the Eastern Front. This position had constantly threatened Paris and forced the Allies to maintain defensive positions. It was at a forward listening post at the front lines of Saint Mihiel that Lorton W. Register, of Ray City, had been killed by artillery shelling in March, 1918. After the Ainse-Marne Offensive in July, General John J. Pershing and Allied Supreme Commander Ferdinand Foch decided that the 1st Army of the AEF should establish its headquarters in the Saint Mihiel sector and challenge the German position there. The attack at the St. Mihiel Salient was part of a plan by Pershing in which he hoped that the American forces would break through the German lines and capture the fortified city of Metz. Thus, on September 12, 1918, the American Expeditionary Force (AEF) launched its first major WWI offensive operation as an independent army. The attack began with the advance of Allied tanks across the trenches at Saint Mihiel, followed closely by the American infantry troops. 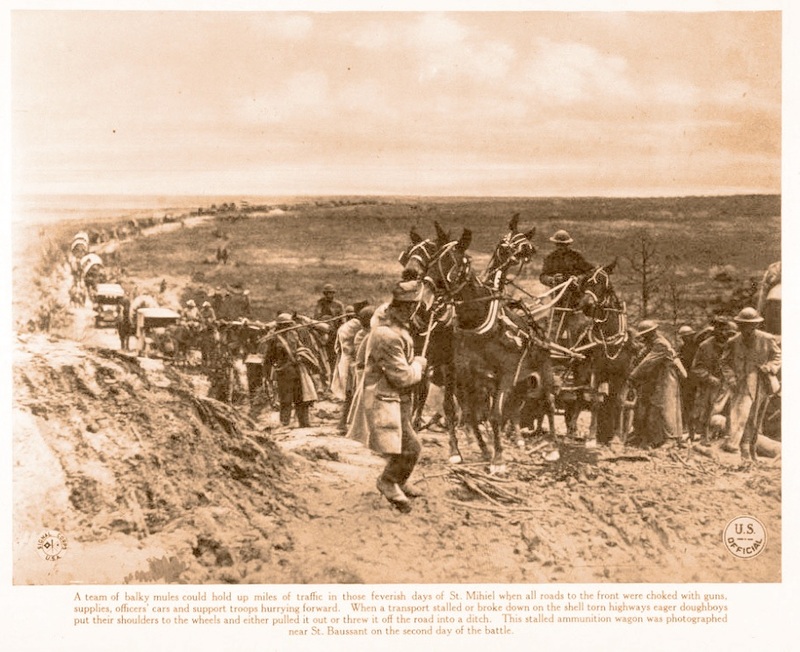 Foul weather plagued the offensive as much as the enemy troops, as the trenches filled with water and the fields turned to mud, bogging down many of the tanks. The ammunition convoys to which Corp. Rossie O. Knight was assigned worked around the clock for 80 hours to keep the advancing American troops supplied. Also present during the Saint Mihiel Offensive were Lieutenant Asbury Joe Hall, Jr. and Private John Bryan Thomas, both of Adel, GA, and Private Carlie Lawson of Ray City. Lieutenant Hall was attached to Company “H,” 3rd Infantry and had been in France since January 1918. During that time he had been gassed once and wounded twice; Hall’s luck ran out on the second day of the Saint Mihiel Offensive, September 13, 1918 when he was struck and killed by an artillery shell fragment. John Bryan Thomas served on the Ammunition Train for the 5th Division. Thomas contracted Influenza which resulted in his death on August 15, 1918. Private First Class Carlie Lawson fought at Saint Mihiel with Company G, 11th Infantry. Despite the conditions, the American attack proved successful—in part because the German command made the decision to abandon the salient—and greatly lifted the morale and confidence of Pershing’s young army. By September 16, 1918, Saint Mihiel and the surrounding area were free of German occupation. 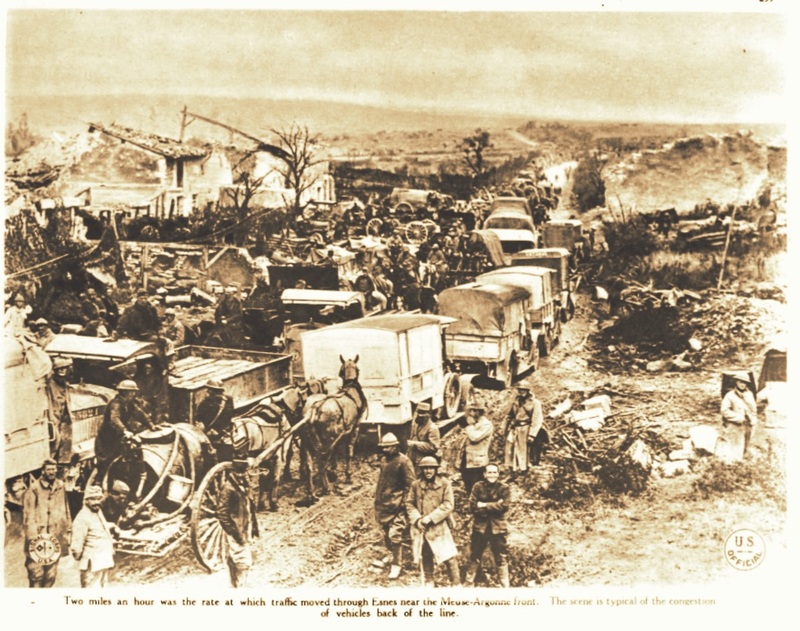 But the U.S. offensive at St. Mihiel faltered as artillery and food supplies were left behind on the muddy roads. Plans for the attack on Metz had to be given up. As the Germans fell back to new positions the American forces immediately shifted further south where they combined with British and French forces in a new offensive near the Argonne Forest and the Meuse River. In the wake of the U.S.-run attack at Saint Mihiel, some 400,000 U.S. troops were assigned to the region to participate in what was to be the final operation of the war, the Meuse-Argonne offensive, also known as the Battle of the Argonne Forest. Under the command of General Pershing, the American-led attack began at 11:30 pm on September 25, 1918 with a six-hour-long artillery barrage against the German positions. The preliminary bombardment, using some 800 mustard gas and phosgene shells, killed 278 German soldiers and incapacitated more than 10,000. The infantry assault, carried out by 37 French and American divisions, began at 5:30 the next morning with the support of more than 700 Allied tanks and some 500 aircraft from the U.S. Air Service. Led by the advancing tanks, the infantry troops advanced against German positions in the Argonne Forest and along the Meuse River aiming to cut off the entire German 2nd Army. By the morning of the following day, the Allies had captured more than 23,000 German prisoners; by nightfall, they had taken 10,000 more and advanced up to six miles in some areas. The Germans continued to fight, however, putting up a stiff resistance. 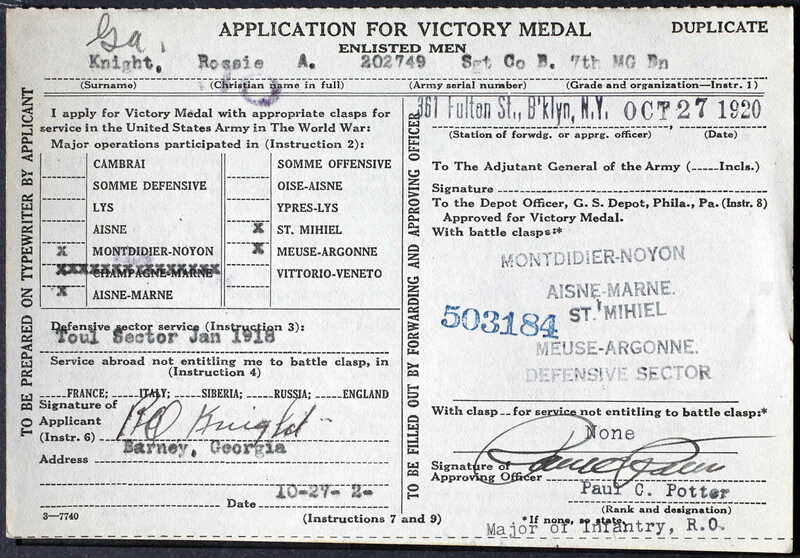 On September 30, Pershing called a halt to the Meuse-Argonne offensive, but operations were resumed October 4. The Germans were exhausted, demoralized and plagued by the spreading influenza epidemic, whereas arriving U.S. reinforcements where strengthening the Allied advance. American reinforcements in transit to Europe included hundreds of Georgia soldiers, dozens from Berrien County, who went down with the ill-fated troopship HMS Otranto off the coast of Islay, Scotland on October 6, 1918. Among the Otranto dead were Rossie’s cousin, Ralph Knight, and fellow Ray City resident Shellie Lloyd Webb. About that same time Sammie Mixon of Allenville, GA, who was fighting in the Meuse-Argonne with Company “H”, 18th Regiment, First Division, was wounded in action and died from pneumonia a few days later. 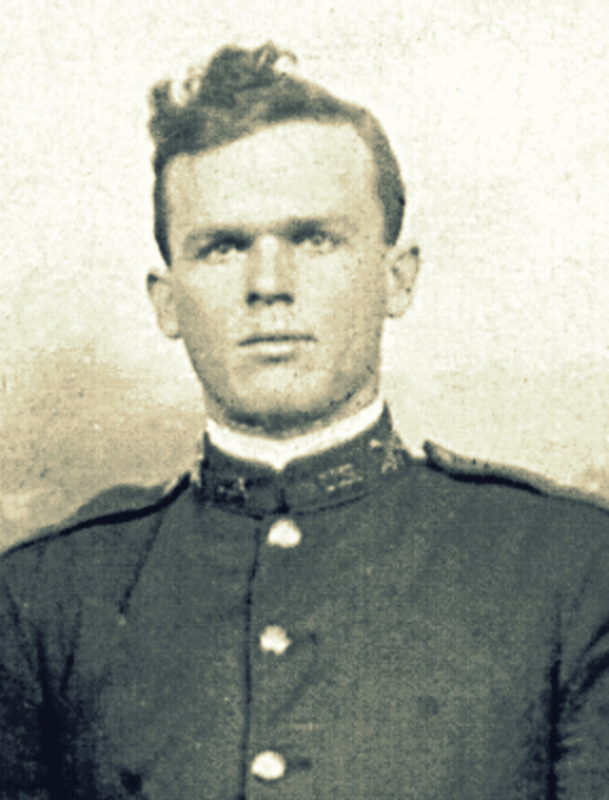 In the early morning hours of October 8, 1918 Isaac R. Boyett, of Adel, GA was fighting with Company C, 328th Infantry in the Meuse-Argonne Offensive near the the French town of La Forge when he was severely wounded by machine gun fire. Later that same day, Boyett’s regimental mate, Alvin C. York, earned the Medal of Honor for his actions in capturing 132 German soldiers at the village of Châtel-Chéhéry. Boyett died of his wounds two days later. Carlie Lawson also fought in the Battle of the Argonne Forest with Company G, 11th Infantry; he returned from the war and lived to be 100 years old. The German troops stubbornly held on in the Argonne Forest for another month before beginning their final retreat. William Wiley Tison, of Ray City, was with the 51st Infantry, 6th Division, which participated in the Meuse-Argonne operation from November 1-8, 1918. With arriving U.S. reinforcements the Allies had time to advance some 32 kilometers before the general armistice was announced on November 11, bringing the First World War to a close. The Meuse-Argonne Offensive was a part of the final Allied offensive of World War I that stretched along the entire Western Front. It was fought from September 26, 1918, until the Armistice on November 11, a total of 47 days. The battle was the largest in United States military history, involving 1.2 million American soldiers, and was one of a series of Allied attacks which brought the war to an end. The Meuse-Argonne was the principal engagement of the American Expeditionary Forces during the First World War and was “probably the bloodiest single battle in U.S. history”. From May 1918 to the Armistice on November 11, 1918, the First Division suffered more than 20,000 casualties, including killed, wounded and missing. With commanders such as MG William Sibert, MG Robert L. Bullard and MG Charles P. Summerall, the First Division established a reputation for excellence and esprit de corps. On November 12, the 1st Division moved into Bois de Romagne. 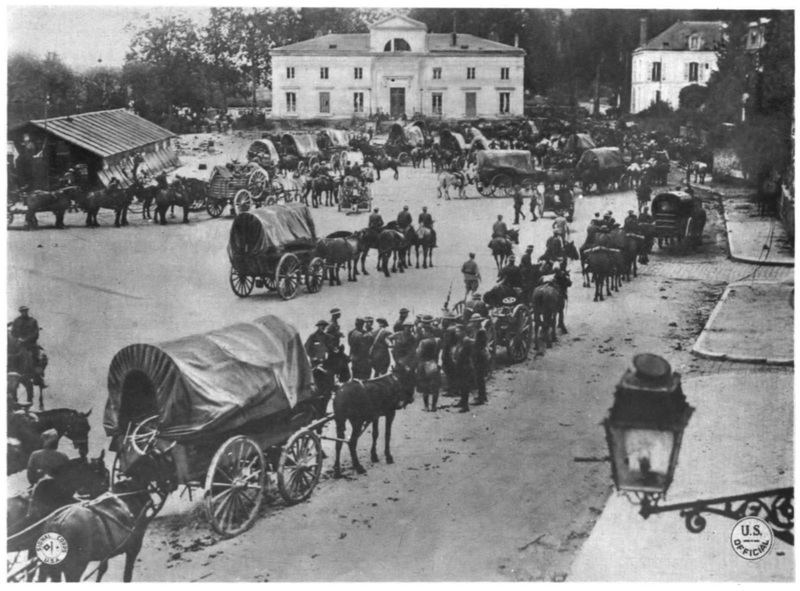 On Nov 13, the Division moved via Malancourt and Verdun-sur-Meuse into billets near Domremyla-Canne and Gondrecourt, and prepared for the advance into Germany as a part of the Army of Occupation.